This is the largest of my "punch-out" type cards, measuring about 4" x 6". 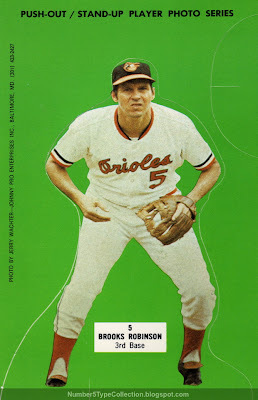 Johnny Pro Enterprises of Baltimore published a total of 28 cards in this Oriole-only set, numbered by player uniform. The set count includes alternate poses for Jim Palmer (wind-up and follow-through), Bobby Grich (fielding and batting), and Brooks Robinson (fielding and batting). Collectors punch out the upper-right tab as a base for the player pose. I've only seen full cards for sale, so assume that's most of what remains in the market. 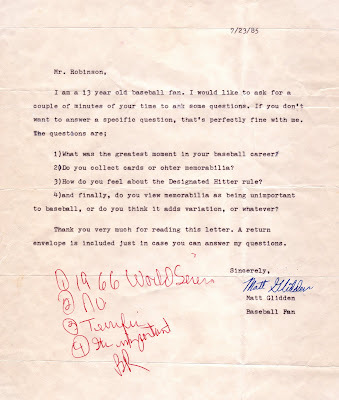 Many years ago, I sent Mr. Robinson this letter with an autograph request and a few questions. As I recall, it was back in my hands less than two weeks later, pretty quick for a HOFer! Very fittingly, he wore #5, which the Orioles retired when Brooks hung 'em up in 1977. Fakes / Reprints: I haven't seen any reprints of the Johnny Pro sets. It'd be hard to reprint this kind of die-cut card and probably isn't worth the money to try.